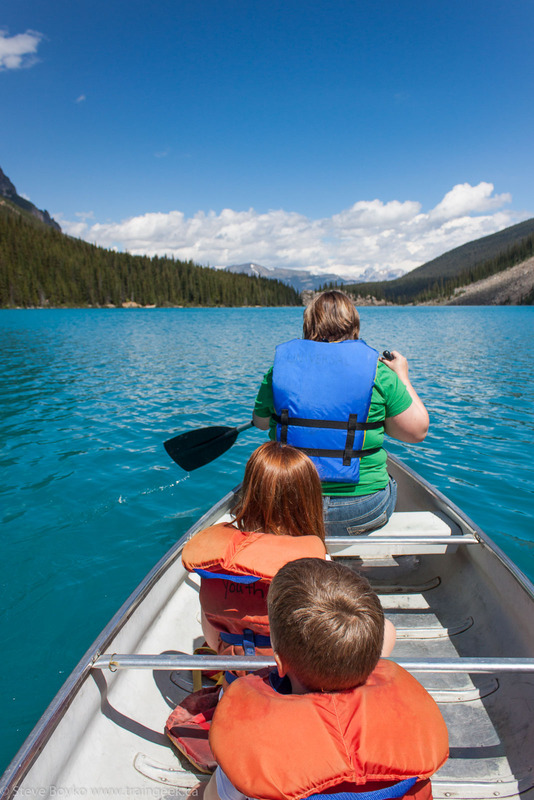 My family camped in Banff, Alberta in July 2013. 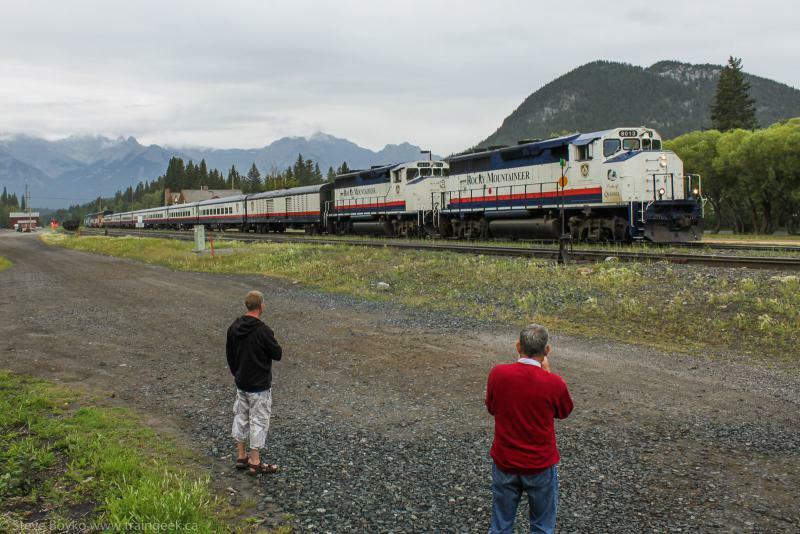 In part 1 I described a successful early morning of railfanning in Banff and at Morant's Curve. 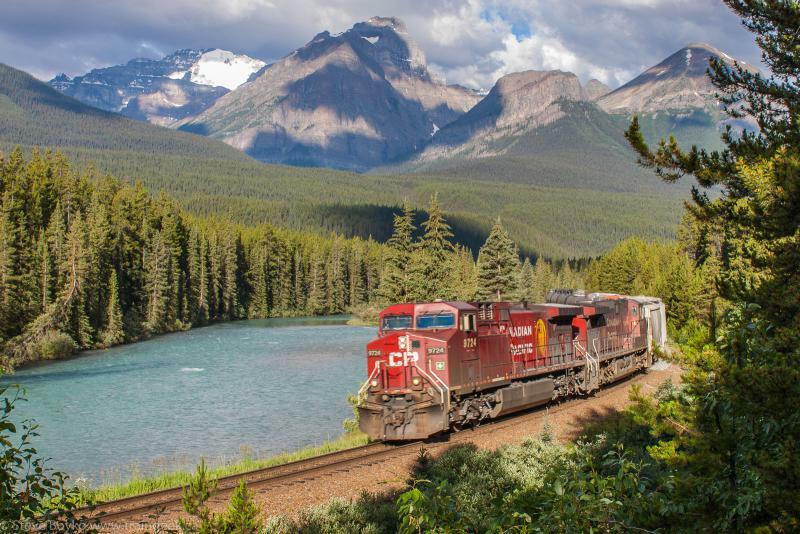 Here I complete the tale, still at Morant's Curve near Lake Louise. After the three CP trains rolled by, there was a lull for about an hour. 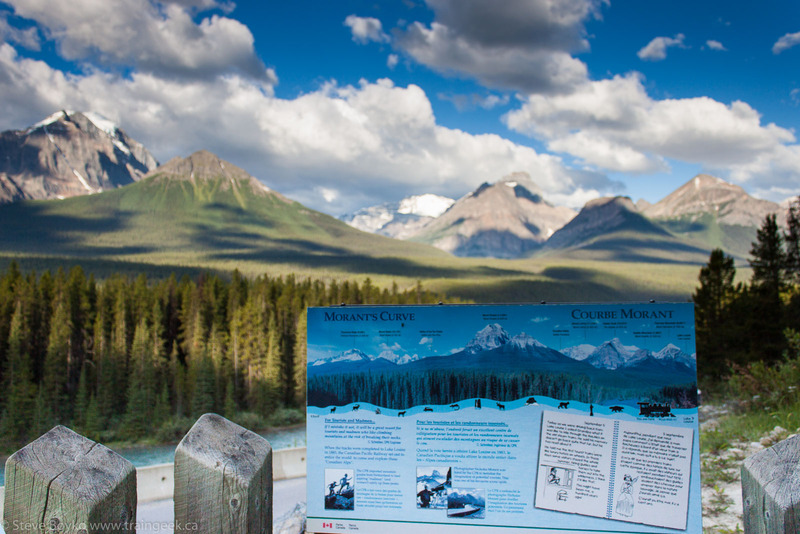 During that time I walked up to the small parking lot near Morant's Curve to look at the interpretive display. At 08:18 CP 9724 started around the curve. You can see that the sun has finally reached the track! 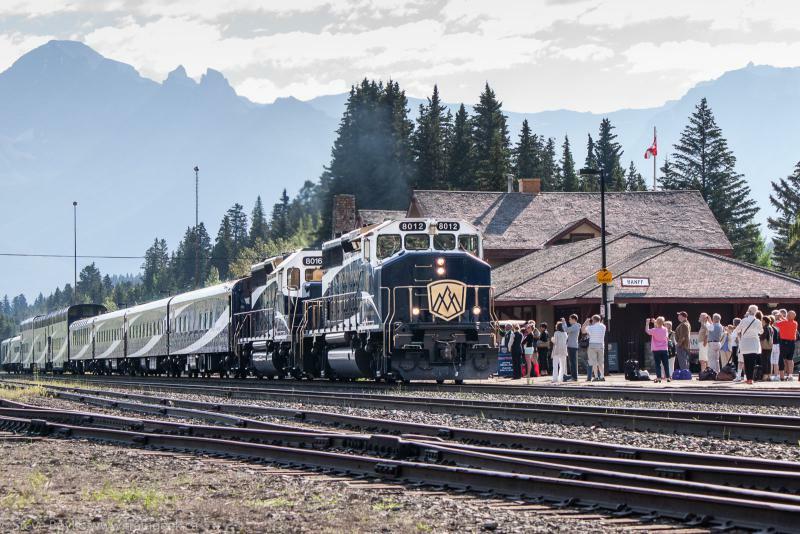 That was exciting... but I decided it was time to head back to Banff to try to catch the Rocky Mountaineer. 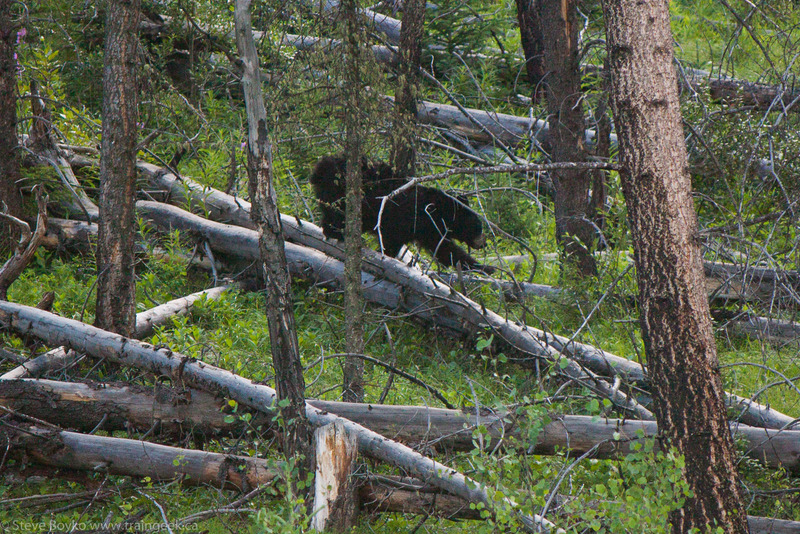 On my way there, I saw a bear up the hill from highway 1A. I took a couple of really long shots before continuing on. 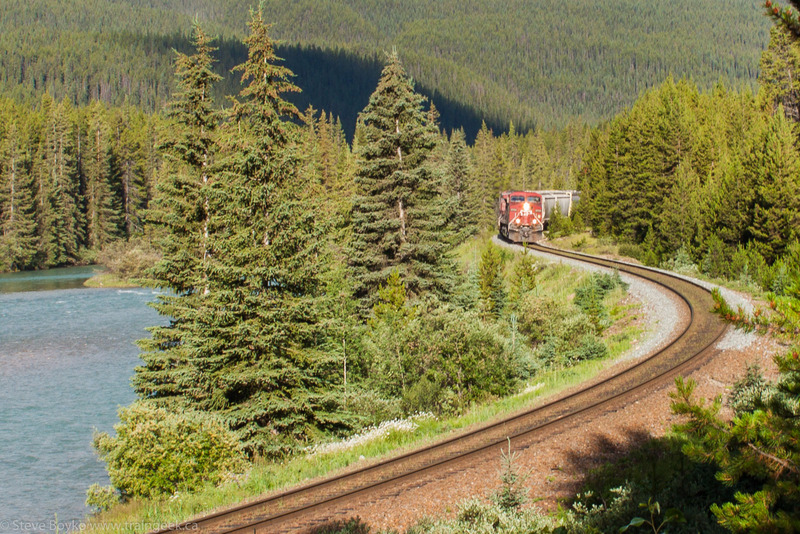 Once I rejoined the Trans-Canada Highway, I spotted a westbound CP freight waayyy in the distance. 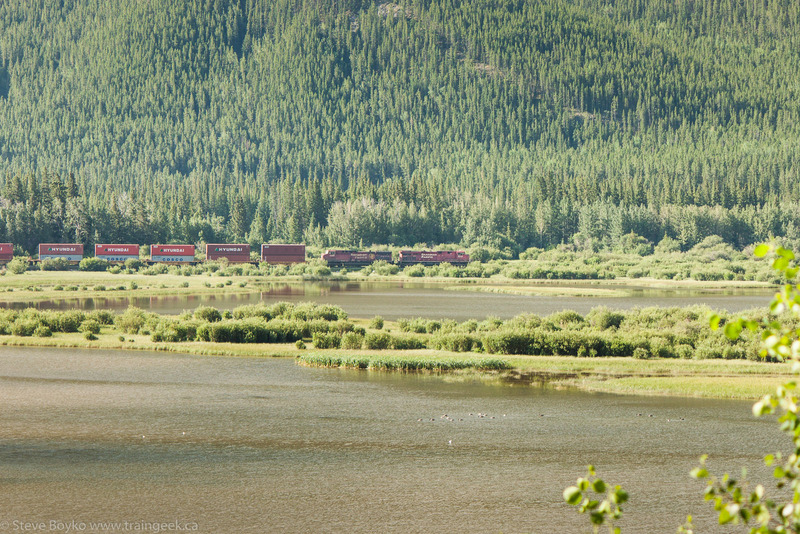 I stopped at a scenic viewpoint and took a couple of photos of CP 8877 West. 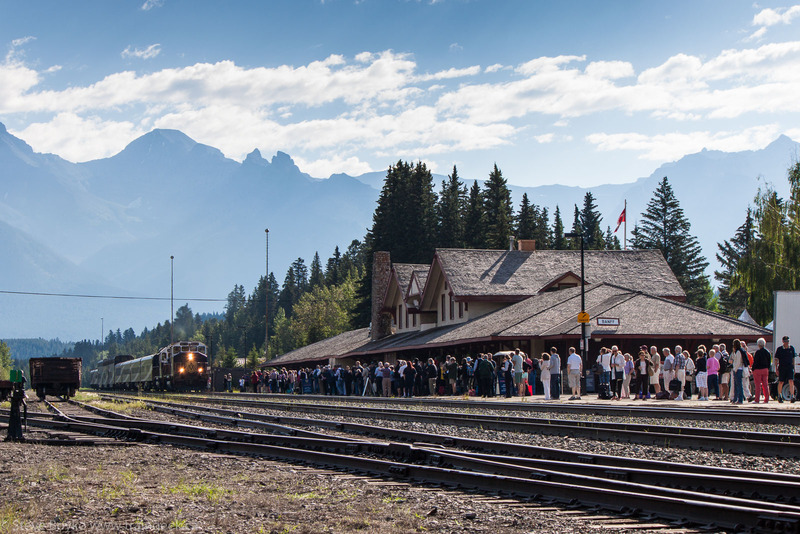 I arrived at the station in Banff to find a large crowd of people waiting for their train. 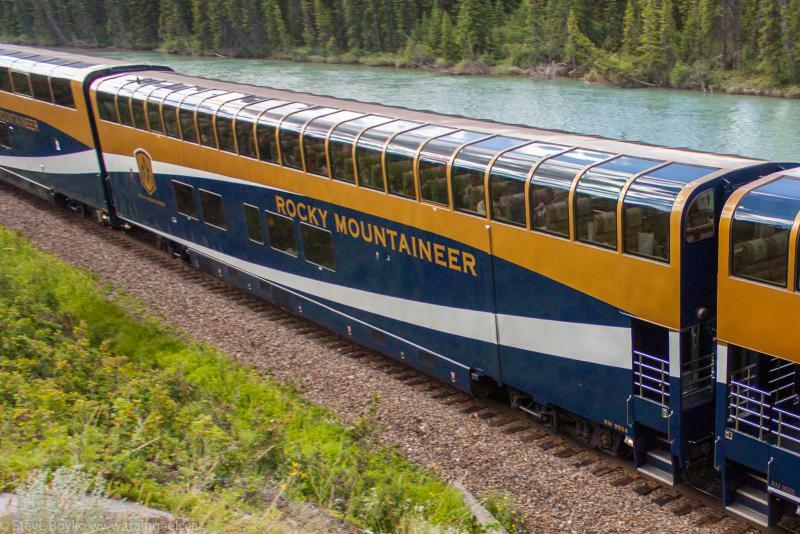 At a few thousand dollars per person, there was a lot of money spent on the Rocky Mountaineer! They came to a stop and the passengers started boarding. It didn't take very long for everyone to get on board. 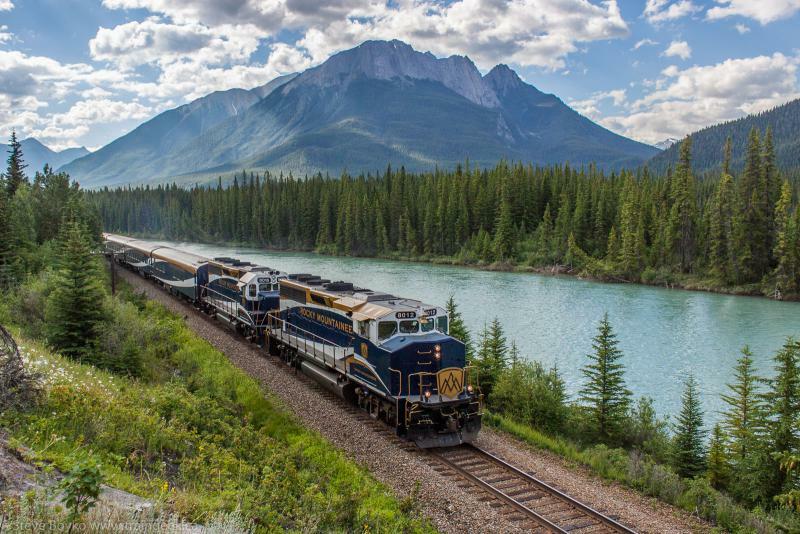 This is my favourite photo of the Rocky Mountaineer in Banff. 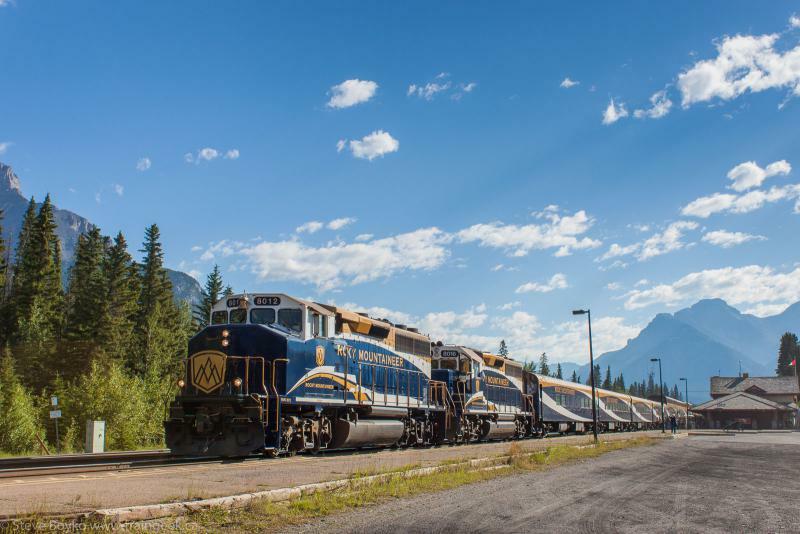 Note that 8012 was the second unit in 2010, and it was the leader on the Rocky Mountaineer in 2013. I didn't hang around to see them leave as I wanted to catch them "on the road". I took this near head-on photo and headed west. 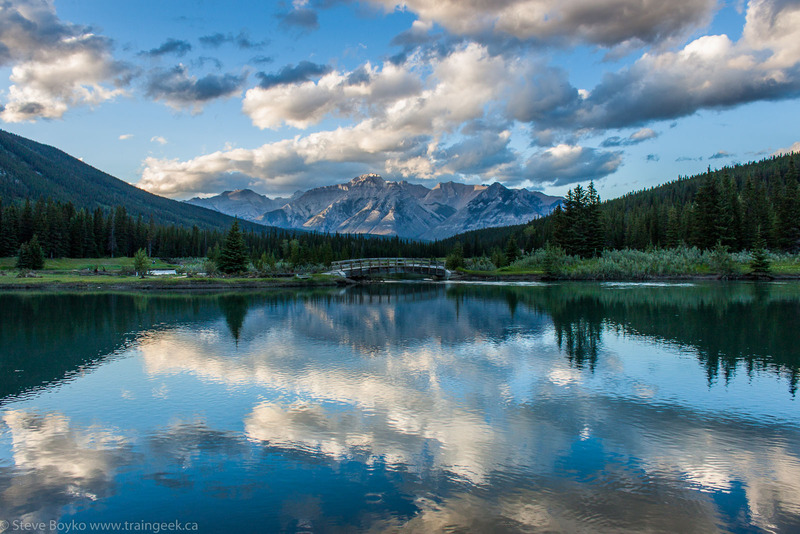 In 2010 I had waited at Banff for the train to leave, and ended up sprinting to get a shot of the Rocky on the road. I wanted a bit more time to set up so I left before the train. I drove to Muleshoe on the 1A and parked at the scenic outlook, and headed down toward the track with my cameras and tripod. I set up the tripod and put the Canon S3 on top, then fired a few test shots with my T1i. Given that the sun was off to the left but ahead of me, the lighting was tricky. I ended up using an exposure bias of -1.3 stops to keep the sky from blowing out. It's always a good idea, if you have time, to fire off a test shot or two and see how it looks and check the histogram to ensure it's not over- or under-exposed. 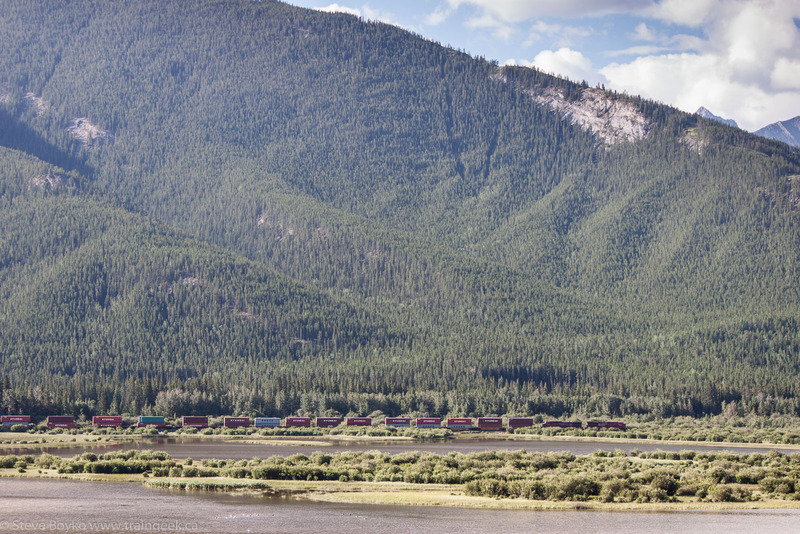 The Rocky Mountaineer rolled along and I captured this photo - exactly what I was looking for. Compare that to 2010's photo, taken with a different camera, fog, and not as much preparation, but in the same location. Those domes look very comfortable! 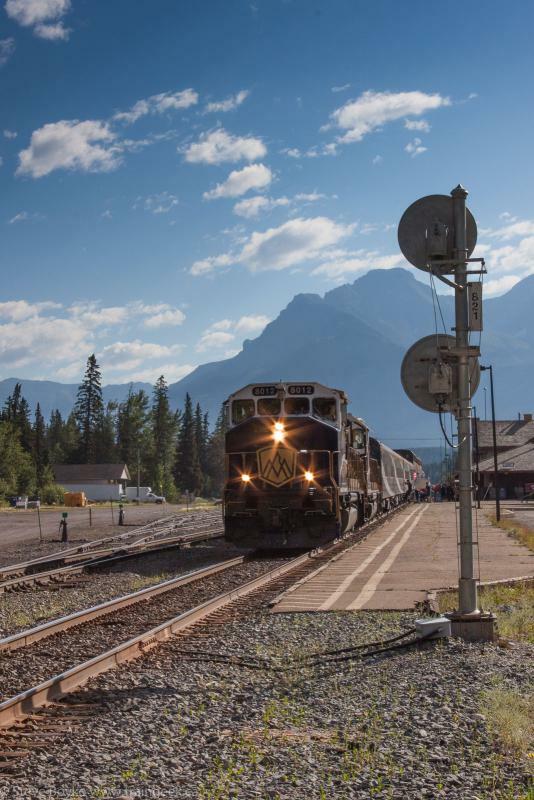 That was the last train I saw in Banff. 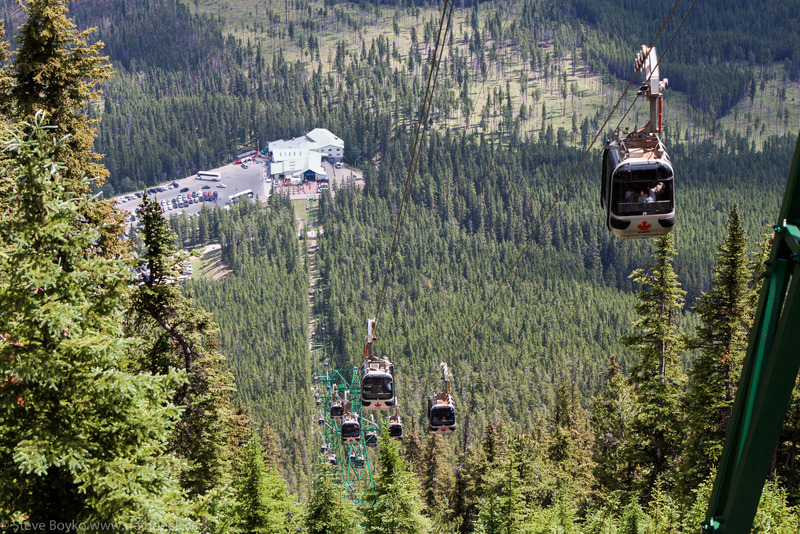 We did go up the gondolas to Sulphur Mountain, always a fun trip. 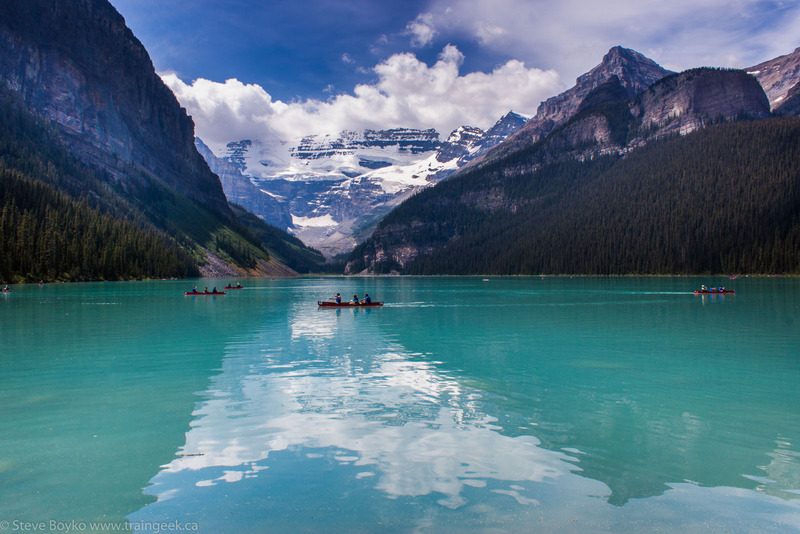 Here's a few random landscape photos to show you just how beautiful Banff is. I can't wait to go back... maybe in 2016. 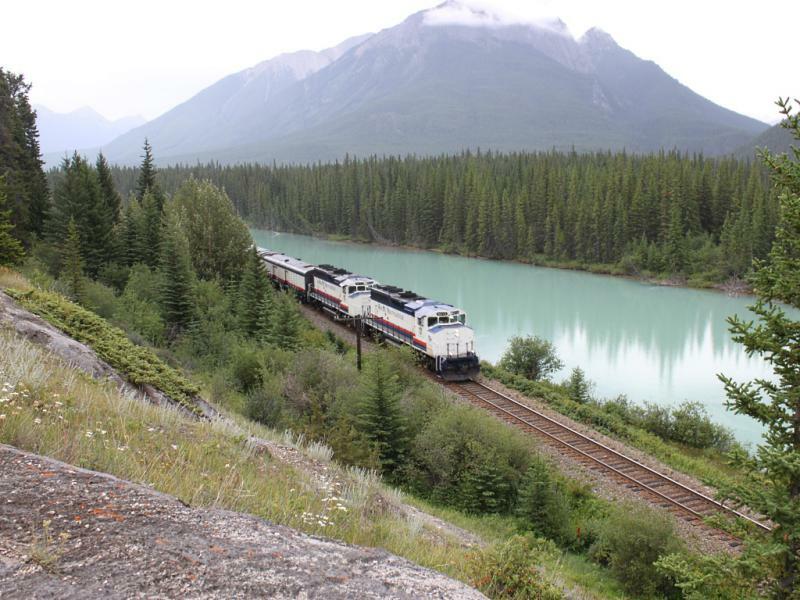 Funny thing Steve, I have never been to Morant's curve. I've passed it a million times for sure. Maybe it's time for me stop on by.